An early artist's interpretation of the dwarf planet Makemake beyond Pluto. 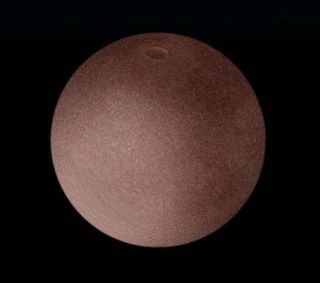 Makemake (pronounced mah-kee-mah-kee) was first observed in March 2005 by a team of astronomers at the Palomar Observatory. Officially known as 2005 FY9, the tiny planetoid was nicknamed Easterbunny by the group. The team was also responsible for the discovery of dwarf planet Eris and involved in the controversial discovery of the dwarf planet Haumea. Makemake is named for the god of fertility in Rapa Nui mythology. The Rapa Nui live on Easter Island in the southeastern Pacific Ocean. Makemake was the chief god, the creator of humanity, and the god of fertility. Makemake is the second brightest known object in the outer solar system, just slightly dimmer than Pluto. At 870 miles (1,400 kilometers) wide, it is about two-thirds the size of the more well-known dwarf planet. It orbits beyond the range of Pluto, but closer to the sun than Eris, taking approximately 310 Earth-years to circle the sun. Astronomers took advantage of the dwarf planet's passage in front of a star to determine that it lacks a significant atmosphere, a surprise given its similarities to Pluto, which has a thin one. The scientists also took advantage of their study to calculate how much light the planet reflected, a rate comparable to dirty snow. The planet is dimmer than Pluto but brighter than Eris. Like all of the known dwarf planets but Ceres, Makemake travels through the Kuiper Belt, the region of ice and rock at the outer edges of the solar system. It can travel as far out as 53 times the distance between the Earth and sun, and come as close as 38 times over the course of its orbit. Makemake spins on its axis once every 22.5 hours, with a day just shorter than Earth's. Makemake's moon, designated S/2015 (136472) 1 but nicknamed MK 2, is about 100 miles (160 km) in diameter. It was seen about 13,000 miles (20,900 km) from the surface of Makemake. The Hubble discovery images suggest that MK 2 is as dark as charcoal, which seems surprising given that Makemake is so bright. One possible explanation is that the moon's gravity is too weak to hold onto reflective ices, which sublimate off MK 2's surface into space, researchers said. MK 2 was spotted in observations made by Hubble's Wide Field Camera 3 in April 2015, after several previous Makemake observation campaigns had failed to turn up any satellites. "Our preliminary estimates show that the moon's orbit seems to be edge-on, and that means that often when you look at the system you are going to miss the moon because it gets lost in the bright glare of Makemake," Alex Parker of the Southwest Research Institute (SwRI) in Boulder, Colorado, who led the image analysis for the Hubble observations, said in a statement. Additional observations should also reveal the shape of MK 2's orbit around Makemake. If the orbit is tightly circular, the moon was probably created by a long-ago giant impact, just like the five satellites in the Pluto system were, researchers said. A looping, elliptical orbit, on the other hand, would suggest that MK 2 was once a free-flying Kuiper Belt object that Makemake captured. Makemake, along with Eris and Haumea, were responsible for Pluto's drop in status from planet to dwarf planet. Though Makemake and Haumea are just smaller than Pluto, Eris is more massive; the dwarf planet Ceres, found in the asteroid belt, is the smallest of the bunch. Haumea and Pluto have satellites, but the rest don't. In 2006, the International Astronomical Union created a new category of bodies known as "dwarf planets," and reclassified the definition of a planet. According to the IAU, a planet circles the sun but isn't orbiting something else, is large enough to be rounded by its own gravity, and has cleared its neighborhood of orbiting bodies. Pluto failed to make the cut because it didn't clear the debris in its orbital path. Additional reporting by Mike Wall, Space.com Senior Writer.